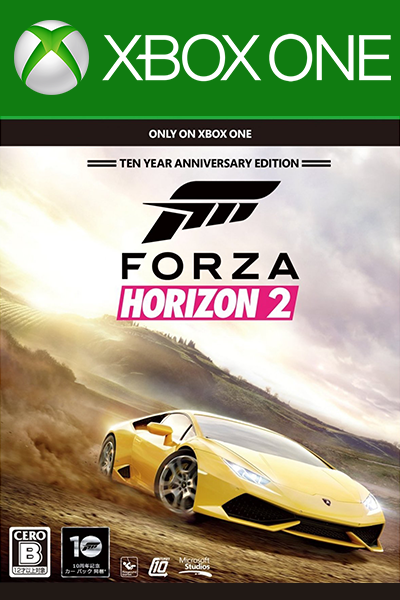 FORZA HORIZON 2 - 10TH ANNIVERSARY EDITION for Xbox One is a digital code with no expiry date. Once bought, this downloadable code will be delivered directly to your email address with no shipping cost. Drive past the sprawling coastlines and towering historic buildings of northern Italy and the south of France in one of the most popular open world racing video games, Forza Horizon 2! Along with the most popular elements from its prequel Forza Horizon, the follow-up offers three times more drivable area across the iconic landscapes of the Cote d’Azur, Tuscany and Provence! With over 700 events in Forza Horizon 2, players can unleash their inner speed-demons on winding ribbons of road as well as vast swathes of countryside. How Real does the Driving Experience in Forza Horizon 2 Feel? The game is overflowing with nuanced elements that help solidify the feel and experience of real-world driving. Developers have incorporated more complexity to the driving experience and now players can engage with their surroundings by ploughing into the shrubbery and fencing. Real-time rendering of light during the day/night cycles and dynamic weather effects take Forza Horizon 2 from a mere racing game to an immersive experience. One press of a button and the game seamlessly transitions from single player to multi-player in online mode, opening up a plethora of opportunities to engage with other players. Players can choose to complete Bucket Lists of mini challenges, compare cars in Car Meets, strap in for heart-thumping cross-country races or explore other game types like Infected and King. The added bonus of 10 specially tuned and painted cars in Forza Horizon 2 - 10th Anniversary Edition expands an already remarkable roster of 200 exquisitely detailed cars. So, what are you waiting for? Shift into high gear for a vacation in the sun-kissed Mediterranean coastline and live the ultimate car fantasy! Buy any of our Xbox Live Gold Memberships and enjoy playing FORZA HORIZON 2 - 10TH ANNIVERSARY EDITION for Xbox One online with friends and fellow gamers, put your gaming skills to the test in online competitions and avail of exclusive Xbox Live Gold member only offers as well. Livecards.co.uk makes buying Forza Horizon 2 - 10th Anniversary Edition for Xbox One as easy as pie! All you need to do is fill in your email address, pick a payment method, complete the payment and voila! The code is yours.